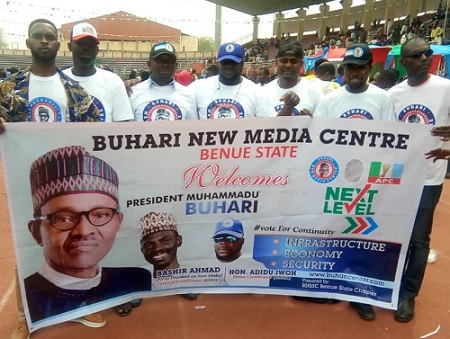 The officials of Buhari New Media Centre (BNMC), Benue State Chapter on Wednesday, February 6, 2019 welcomed President Muhammadu Buhari to Benue State for his presidential rally. The rally which took place at Aper Aku Stadium in Makurdi was attended by many supporters of Buhari and All Progressives Congress (APC). The Benue State Coordinator of BNWC, Comr Adidu Iwoh said President Buhari has done so much for the development of Nigeria and the centre promotes him and his achievements in Nigeria. He described President Buhari as a leader who believes in propelling Nigerians through progressive leadership and as a man who is prudent; his probity and accountability have made him to stand out as "Mr. Integrity" among others. The National Coordinator of BNMC, Bashir Ahmad who is also the Personal Assistant on New Media to President Muhammadu Buhari has extolled Buhari as a man who has the alacrity to work with progressive minds that put the interest of Nigeria above selfish interest. He posits that for the love Buhari has for Nigeria, he has refused to be overwhelmed by self-aggrandizement. Buhari's predilection for progress and development will never wane. He exhorted all Nigerians to continue to support Buhari to make the Nigeria of our dream possible. Buhari New Media centre (BNMC) is set up to deploy social media tools in communicating the achievements of the President Muhammadu Buhari-led administration. The centre has a National Coordinator, Bashir Ahmad who coordinates all the activities of the centre across Nigeria with its headquarters at Gwarinpa in Abuja. Buhari New Media Centre (BNMC), Benue State Chapter.